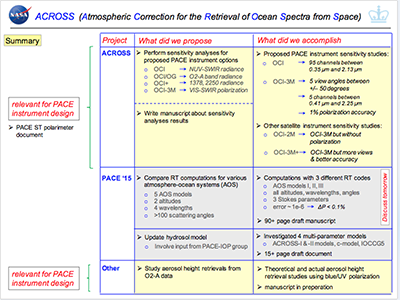 The 2013 ROSES A.25 solicitation calls for studies on atmospheric correction in support of the PACE (Pre-Aerosol, Cloud, ocean Ecosystem) mission. 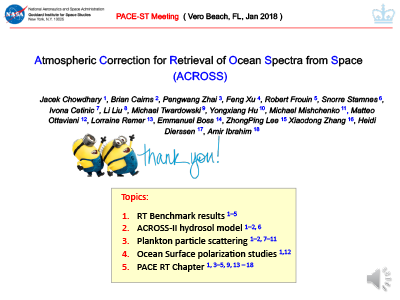 To address this call, we will examine the capacity of PACE-like observations for atmospheric correction by (i) applying statistical methods to compute data information content, and (ii) inverting synthetic and real PACE-like observations into ocean spectra. In step (i), we will focus on the instrument options proposed in the PACE SDT (Science Definition Team) report. 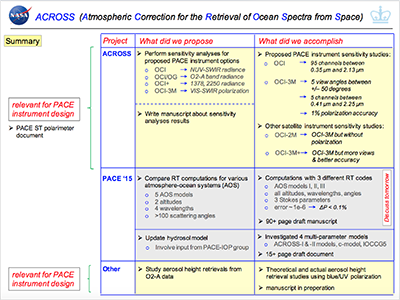 Specifically, we will consider the base instrument option OCI (Ocean Color Imager, which includes the 350, 865, 1240, 1640, and 2130 nm channels for atmospheric correction), and elements of instrument options OCI/OG (i.e. OCI base option augmented by a 820 nm band and an Oxygen A band), OCI/+ (i.e. OCI base option augmented by 940, 1378, and 2250 nm bands), OCI-3M (i.e. OCI base option plus a multi-angle multispectral multi-polarization, or 3M, imager), and OCI/A-3M (i.e. OCI/+ option plus a 3M imager). 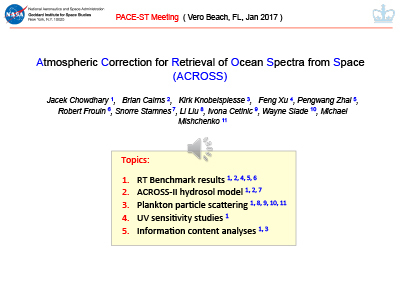 In step (ii), we will apply optimization techniques to extract ocean spectra from various data sets. Specifically, we will apply these techniques to synthetic data created for instrument options with a range of atmospheric-correction performances, as identified in step (i). In addition, we will apply these techniques to three existing measurement sets: the 2011 HOPE-COAST (Hands On Project Experience-Coastal and Ocean Airborne Science Testbed) and the 2013 OCEANIA/ACOCO (Ocean Color Ecosystem Assessments with Novel Instruments and Aircraft/Atmospheric Correction Over Coastal Oceans) measurements acquired in Monterey Bay (which include measurements of inherent optical properties and of chlorophyll), and coinciding HICO (Hyperspectral Imager for the Coastal Ocean) and CALIOP (Cloud-Aerosol Lidar with Orthogonal Polarization) measurements acquired across the globe. 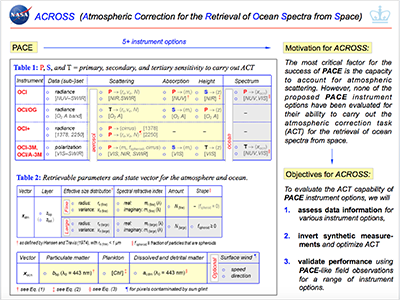 These measurement sets incorporate aspects of the instrument options proposed for PACE and contain data to validate atmospheric correction and/or ocean color spectra retrievals. 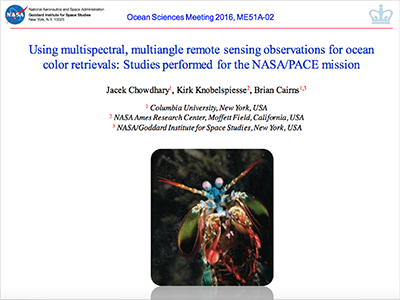 Using statistical methods to examine the information content and inversion of ocean color remote sensing observations is a complex undertaking that requires a multidisciplinary team. 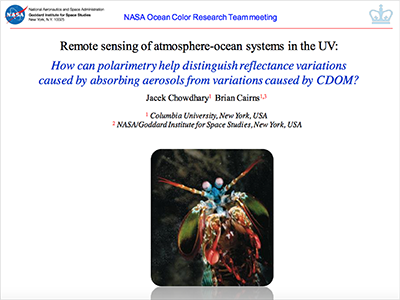 Dr. Chowdhary has worked on ocean and aerosol retrievals from observations by the RSP (Research Scanning Polarimeter) instrument, which is an airborne version of the Aerosol Polarimeter Sensor (APS) onboard the failed 2011 NASA/Glory mission. 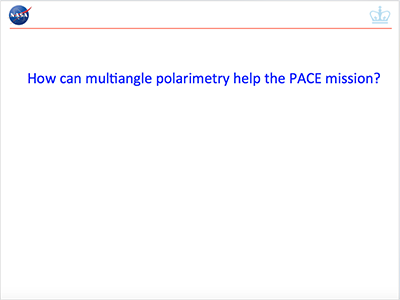 He wrote a radiative transfer program for polarized underwater light, was a member of the Glory ST (Science Team) and PACE SDT, and is PI of ACOCO. Dr. Alexandrov has written cloud inversion algorithms for RSP, and was also a member of the Glory ST. Dr. Knobelspiesse has worked on inverting coincident RSP and Lidar data, has done information content analyses for different satellite instrument options in support of Glory ST and PACE SDT reports, and was a member of the Glory ST. Dr. van Diedenhoven has expertise in simulating and analyzing hyper-spectral and polarimetry data and the Oxygen A-band, as well as in information content analyses. Dr. Cairns was a member of the Glory ST and the PACE SDT, and has developed techniques for the efficient implementation of inversion algorithms. Dr. Kudela has worked extensively on ocean color retrievals and modeling of underwater light field to describe biological-physical coupling in coastal waters. He is the PI of the coastal ocean project that collaborated with OCEANIA. 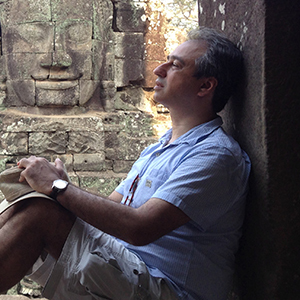 Dr. Guild has expertise in coastal ecosystem science, and was PI of HOPECOAST and OCEANIA. She is now leading the HQ2O (High-Quality Optical Observations: Improving Atmospheric Correction and Remote Sensing of Water Quality in the Coastal Zone) project with Dr. Kudela. 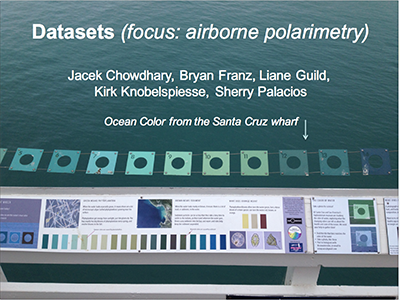 Dr. Palacios has expertise in discriminating phytoplankton types from ocean color, and is processing and analyzing coastal data from the HOPE-COAST and OCEANIA campaigns for the HQ2O project.